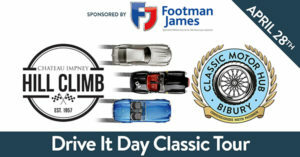 After a sell-out inaugural event, Footman James and The Classic Motor Hub’s Drive-It Day Classic Tour is back by popular demand. Held on 28th April 2019, the classic car-focused companies have increased numbers to 50 cars (from 30 in 2018) in a bid to get more classic cars and owners on the UK roads in conjunction with Drive-It Day. The Drive-It Day Classic Tour, which starts at 09:00 on Sunday 28th April 2019 is inspired by the famous Federation of British Historic Vehicle Clubs® Drive-It Day, aimed to motivate owners and classic car fans to use their vehicles. Starting from the impressive Chateau Impney hotel, famous for its historic motoring hill climb, the 50-strong Drive-It Day Classic Tour convoy will drive to Cotswolds-based Classic Motor Hub to see the five-acre site dedicated to classic and modern performance machines. Tickets to the Drive-It Day Classic Tour are available on a first-come, first-served basis, priced at £15 each. This includes a route card, rally plaque for a car and a £5 donation to Footman James’s nominated charity Mind, the mental health charity. Each ticket is for one car and the organisers encourage as many people as possible to join in the fun, as such there is no limit on the number of passengers in each car. The Drive-It Day Classic Tour is open to 50 cars. Tickets will be available to purchase on classicmotorhub.com from Tuesday 29th January. For 35 years, Footman James has continued to be one of the leading specialist insurance brokers for classic vehicle owners, restorers, collectors, motor traders and competitors. Footman James has enjoyed a unique relationship with vintage and classic vehicle enthusiasts and clubs; working with over 150 clubs and partners offering policies with benefits that are important to the enthusiast. Footman James also insures a combined value of £2.5bn worth of vehicles; all of whom are dealt with by one of 150 dedicated members of staff that deliver and maintain a high level of service.